Senior boat reviewer John ‘Bear’ Willis got to test the wonderful Sailfish 2800 Platinum. This aluminium powercat was powered by twin Honda BF150 outboard motors. It’s a long way to the shelf if you wanna fish ’n’ troll – and it often feels a damn sight further on the way back. If you want to tackle big fish in even bigger water you need to trust your equipment. Sure, we get days where you could waterski to the offshore grounds and back but they’re a rarity. Even a cruising sojourn through the Whitsundays can turn hellish. It’s a bloody long way across Moreton Bay in that nasty spine-shattering chop and even more treacherous to challenge the unpredictable Southern Ocean. Then there are the rigours of beach launching and the extreme tidal ranges in our north and west where long and often remote passages leave you feeling insignificant in the wide open ocean. Let’s face it, when the crap hits the fan you need to trust your boat with total conviction – and two engines are certainly more comforting than one. Aluminium construction is light but strong. 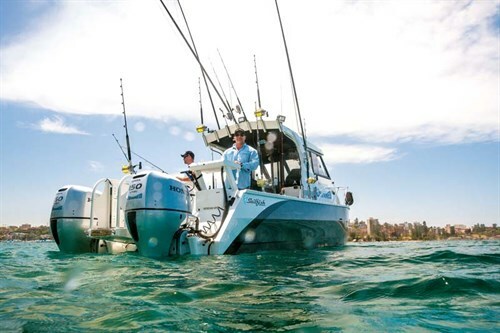 The Sailfish 2800 Platinum package that featured these twin Honda BF150 outboard motors is legally trailerable without wide-load restrictions with its 2.5-metre beam. It offers huge internal volume with the beam carried all the way forward. The big, deep sponsons allow self-draining decks and high freeboard while the tunnel airflow creates a very soft ride. Its lighter-weight hull efficiency reduces fuel consumption — but it has the ultimate stability of twin-hull technology, and the safety of twin engines. During our Sailfish 2800 review out of Sydney Harbour we quickly rounded North Head, where I was again reminded of the confidence you can place in these twin BF150 Honda four-stroke outboard engines. They are so smooth and quiet, when close the back doors it feels like they’ve almost disappeared – until you take a look at the GPS and realise the speed you’re travelling at on the cushion of air. 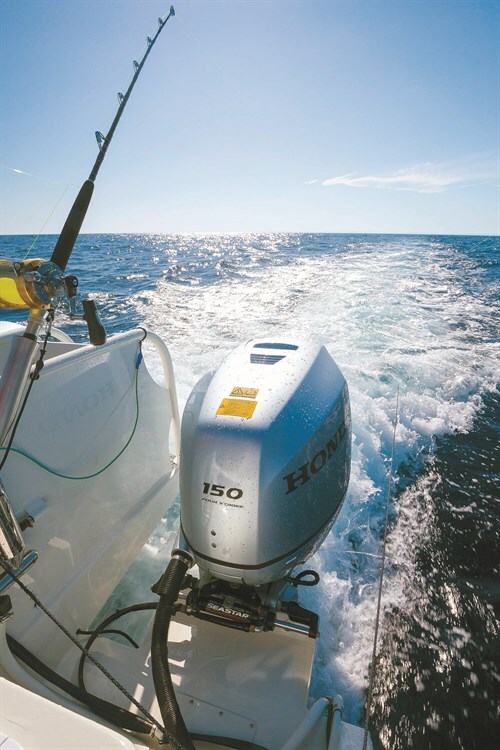 The Honda BF150s are advanced dual overhead cam, in-line four-cylinder marine engines that benefit from decades of Honda’s automotive and racing experience. Dual-Stage Induction delivers top performance at all revs, and Lean Burn Control automatically adjusts the air-fuel mix to maximise power and efficiency. Honda says its Variable Valve Timing and Lift Electronic Control was developed for its high-performance sports cars, and the system ensures smooth, stable idling with reduced fuel consumption, while increased valve lift at high revs broadens the torque curve and provides incredible top-end power. The twin Honda BF150 outboard engines also feature Multi-Port Programmed Fuel Injection for immediate starts and instantaneous yet fuel-efficient throttle response. All shafts, the steering arm and the tilt tube are stainless steel using the patented "double-sealed" multi-layer paint process to ensure maximum corrosion protection. They’re quiet, they’re smooth, they look great and they’re manufactured by one of the world’s most reputable marine engine companies, and there’s a terrific dealer network too. And they’re well-priced and deliver ballsy performance to thrill your pants off. 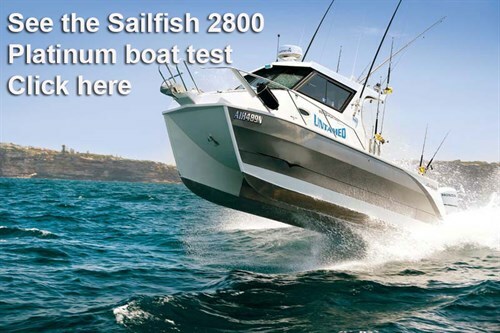 See the full boat test: Sailfish 2800 Platinum review. 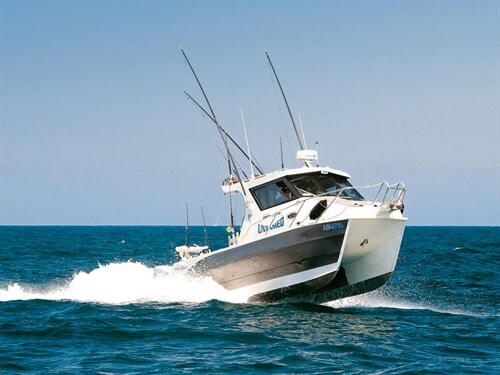 The Sailfish 2800 Platinum with twin Honda BF150 outboards left us speechless. We powered the journey to the shelf in relatively light swell but with enough action to really get the feel of the package. We travelled around 20 nautical miles on the plane before backing off to trawling speed and setting a spread of skirted lures. It was just over an hour’s run, averaging 20 comfortable knots at 4100rpm. She stood proud and comfortable throughout, drinking a miserly 28 litres per hour (estimated) each side. We played through the rev range and whilst still comfortable at higher speed (26kt at 5000rpm using approx 38L/h per side) we preferred to travel a little more conservatively and save a considerable amount of fuel. However, with twin 240L fuel tanks included as standard there’s no real need – the engines aren’t working hard and neither is the hull. Opened up to wide-open throttle, we discovered a thrilling 37kt at 6000rpm, so she’s perfectly propped and set up. And she may get slightly more speed without the swell, current and surface chop. See the full version of this review in Trade-A-Boat #477, on sale April 21, 2016. Why not subscribe today?